And what a lovely morning it is too! The sun is shining, my veggies and fruit are growing wonderfully and my son is about to be picked up from the airport. He is over for a visit. He went over to the UK last year before his final year at school for a holiday with his uncles, and he phoned me up and told me he had got a job and wasn't coming back! I was heartbroken. But we bring them up to give them wings and fly away and he's been gone for a year now. He's over for a holiday and I can't wait to see him! On the stitching front, I have nearly finished the new series; just two to go. On a 'wow what a beautiful morning' note I have had two lovely items of post! I'm in a birthday thread exchange organised by Cath Willey (wonder woman: she gives a lot to the world of stitching) and for my birthday, the wonderful Lonneke made me a card and sent me some threads..but they never got here! They went missing! I was fine with it, it is the thought that counts after all and Lonneke can't control the actions (or in this case inaction) of the postal service. I didn't want her to feel bad. I know how I felt when my Christmas giveaway disappeared..it's heartbreaking because you put thought into things and the recipient doesn't get to see it. Anyway, I forgot all about it to be honest. Imagine my surprise then when this arrived! The card has the cutest little flowers on it and I'm going to frame it and put it in my craft room! 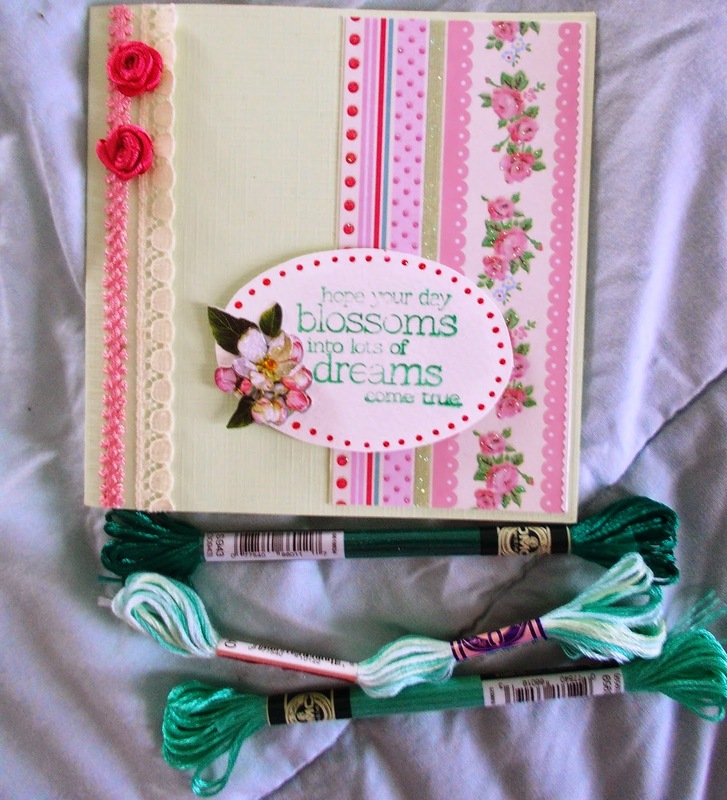 The stamped words say ' Hope your day blossoms into lots of dreams come true'. Isn't that just beautiful! For many people this year, the themes of their lives seem to be appreciate the little things because the little things are what make each day special and live is meant to be lived today! So it is perfect. Thank you Lonneke! The threads are lovely. There's a green variagated thread, a bright, dark green silky thread which is just lovely to touch. It is a DMC silk? I will have to check. There's also a DMC green thread which I didn't have so now, thanks to Lonneke, I now have every single DMC stranded cotton colour! I was also lucky enough to win a prize draw on facebook! And that really was a surprise as I only left a complimentary comment, I didn't realise it was a competition post! It was run by a lovely page called Pomelo Verde which lets people who craft and make the most beautiful things network and introduce themselves. 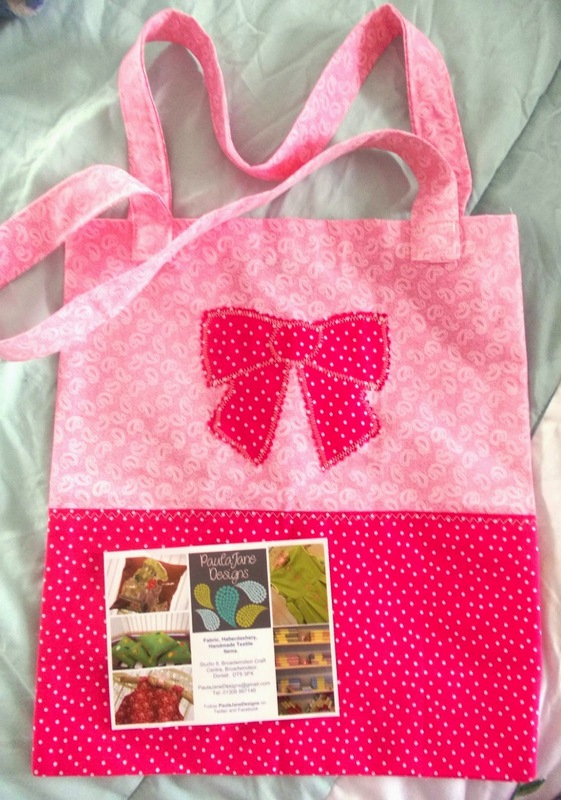 It's a lovely community and a good place to go if you are looking for wonderful artisan gifts. I won a beautiful bag from a lovely lady called Paula from Paula Jane Designs! And then I felt guilty cus I hadn't even realised I had entered so after a lovely chat with the maker, we agreed that I could put it in the prize pile for the fund raising. And look what arrived! It has the most perfect pint ribbon. It perfect! So thank you Paula Jane Designs! I think we are going to have to do the fund raiser soon: I'm running out of room for the prizes! Wow..how lucky have I been? And I am in for a lovely week so I want to share some of the love! ALE SPECIAL FOR MY FB FRIENDS!!! Just for you and my friends on the blog. Let's celebrate the summer by having a sale cus my hubby is picking my son up from the airport and I'm so excited! Lets have a celebration cus my baby is home! Let' have a Buy One Get One Free on pdf charts! For any pdf purchase from www.stitchersanon.com get another chart FREE. Chose your first chart and make a note of the second chart you would like. When you come to pay via paypal, there should be an area where you can message me. If not contact me via the website. Put in the code PRODIGAL SON and the title of the free chart you would like and I will send it with your order. BTW he isnt really prodigal; he left and I got a craft room! Right must go..they just got back from the airport!!! What lovely, creative gifts you have received. So glad you get to see your 'baby' soon! Lovely gifts you received and thank you for the sale; I'll have to see if I can scrounge up enough to get your music butterfly - that one's been calling me ever since you posted it! Have a lovely weekend Gayle! Enjoy your visit with your son! I'm lucky that my kids all live nearby. I can't imagine going a year or more without seeing one of them! And you received very sweet gifts ..
How lovely you son is on his way back... enjoy! The pink tote is marvelous... perfect in fact. I have my prodigal family visiting this weekend, so have been really busy and occupied! Enjoy your time with all your family! That bag is really cute! Hugs! Have a wonderful week with your boy at home, I hope his job is going well and he's enjoying good health. OH yes, the postal ways are not always traceable and it's a pity when lovely and thoughtful gifts disappear. So nice from Loneke to send to you a second time. Have a great week with your son. Enjoy a wonderful time with your son.